The National Film Board of Canada has a collection of 39 films about the Aboriginal Peoples of Canada. The collection covers a wide range of topics such as the arts, government relations, spirituality, and urban life. 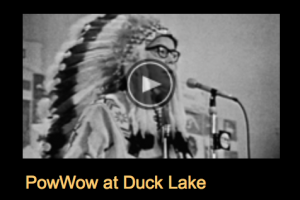 The short documentary film, PowWow at Duck Lake, covers a discussion at Duck Lake, Saskatchewan. Indian-Métis problems, such as education, and lack of opportunities for Native youth, are are discussed in a gathering of Native and white community members. The imagineNATIVE Film & Media Arts Festival began in 1998 and is a festival that supports Indigenous artists in the media arts. Their mission is to dispel the stereotypes placed on Indigenous people through the work from within their communities. This website has information about previous festivals and all the artists who have participated in them. If you click on “Films and Videos” you will be able to view films and videos in the 2014 festival. There are over 100 films and videos in this collection. After watching the videos presented to us in week 8, I wanted to search for more example of youths’ use of technology as a means to document their peoples’ experiences and learn more about their culture, history and perspectives on various issues. That is when I stumbled upon the Nanisiniq: Arviat History Project. This is a collaborative project involving elders and youths from Nunavut as well as the University of British Columbia. The site includes many videos in which the youths interview elders, other members of the community and each other to gain a better understanding of their culture while documenting it in an effort to preserve it. A historical timeline and stories about history, the caribou and survival skills are also featured in the site. This is but another great example of how youths are using media as a medium and an opportunity to tell others about their culture and present it to the world. Despite living in the same country, these youths recognize that Canadians know very little, if anything at all, about their culture and ways of life. One of the youths involved in the project discusses how the Government isn’t properly educating Canadians about Inuit culture, which is why he feels it this project is important to teach his peoples and others about their ways of life in order to keep their culture alive. This site shows how youths are able to create something that is positive and educational when given the proper tools, freedom to be creative and access to traditional knowledge. I also came across this article in which a local Vancouver-based hip-hop artist talks about how she uses media and music to bring awareness to the missing and murdered Indigenous women. Hip-hop, which she describes as a “contemporary form of oral tradition”, is how she communicates her peoples’ history for others to hear. The song “Sisterz” is quite powerful. Indigenous Ways of Knowing is a short video in which Bruce Martin discusses the connection between language and culture and the different ways of knowing. Martin discusses how the English language is, at its roots, comprised of words taken from many other languages and therefore no longer has a connection to place. He also comments on how English is a language of nouns whereas Ojibwe is a language of verbs that describes their worldview. In Ojibwa culture, the world is alive and everyday things and objects that Europeans would consider inanimate are considered by the Ojibwa to possess spirit and are in fact animate. The relationship that the Ojibwa have with the world around them is juxtaposed by the lack of relationship that Westerners have with their environment. This video is a nice introduction to considering the differences between Indigenous and Western ways of knowing. I particularly like that Martin discusses the connection between language and culture. For Indigenous peoples, the loss of their language also means the loss of their culture. I would imagine that English is an inadequate language replacement for Indigenous peoples in maintaining a connection with the land and their culture. This video has given me some things to think about as I delve into my research on Indigenous ways of knowing.